St. Louis County charges Washington Post’s Lowery for Ferguson reporting. Police advance through a cloud of tear gas toward demonstrators protesting the killing of teenager Michael Brown on Aug. 17, 2014 in Ferguson, Missouri. St. Louis County prosecutors charged Washington Post reporter Wesley Lowery with trespassing and interfering with a police officer’s performance of his duties, stemming from an interaction inside a McDonald’s with local police while Lowery was covering the reaction to the shooting of Michael Brown last year. According to the Post, Lowery received a court summons dated Aug. 6th, a week before the one-year statute of limitations was set to expire on the trespassing charge. Lowery has been ordered to appear in a municipal court on Aug. 24 and could face arrest if he fails to show. Each count carries a possible $1,000 fine and up to a year in jail. 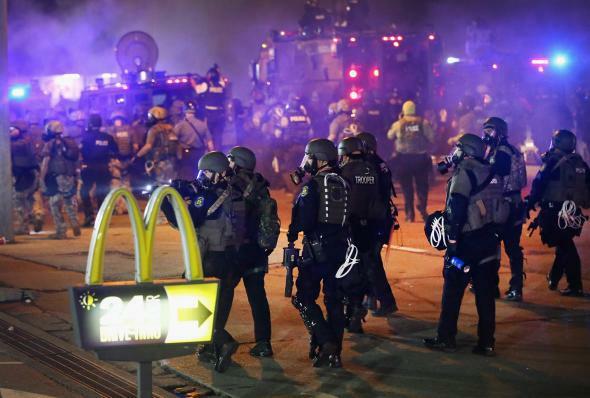 Lowery and Huffington Post reporter Ryan Reilly were confronted by St. Louis County police officers in August 2014 while in a Ferguson McDonald’s, which was being used as a hub by reporters covering the aftermath of the Michael Brown shooting. Lowery detailed his arrest in a piece for the Post last August describing police officers demanding he leave the restaurant, stop recording the interaction on his cellphone, and ultimately slamming him up against the soda machine and handcuffing him for not packing up fast enough. Both Lowery and Reilly were taken to the Ferguson police station and held for an hour-and-a-half before being released. According to [this month’s] summons, “Lowery is being charged with trespassing on private property despite being asked to leave,” the Post reports. “He is also charged with interfering with a police officer’s performance of his duties because, the summons alleges, he failed to comply with ‘repeated commands to immediately exit’ the restaurant.” Reilly said on Monday evening he had not been charged, but a St. Louis County spokesman told the St. Louis Post-Dispatch Reilly was being charged with the same counts as Lowery.